Porchetta is a speciality from the Umbrian region of Italy. 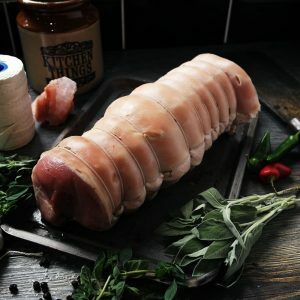 It is a whole suckling pig boned, rolled and stuffed with fresh herbs and a little garlic. Porchetta is a unique product and makes an excellent centrepiece. A very manageable way of getting suckling pig on the menu. If you like the flavour of rare breed pork, then you’ll love our rare breed suckling pig. The flavour and succulence you experience from outdoor reared pigs seems intensified in the younger meat, with added tenderness. We believe you’ll never have tasted such delicate, crisp crackling. Guaranteed to wow! Contact us here for more information or request a call back and we’ll call you or email you back.